Joseph de Bologne (Chevaliere) de Saint George was a French violinist, harpsichordist, composer, conductor, military leader, and champion swordsman, born on December 25, 1745 (Bach was 60 years old.) He was never what one might call a touring concert violinist. He is remembered for being part of the French aristocracy and military prior to and during the French Revolution, despite being the son of a slave (his mother.) As early as age 18 (1764), he obtained the position of Officer of the King's Guard. He was also one of the first Black Masons in France. In 1787, he beat Charles De Beaumont (the infamous French spy, diplomat, and transvestite) in a famous fencing duel. His first teacher in music was his father. Later on, after age 8, he may have studied violin and composition with Jean Marie Leclair in Paris. It is thought that by 1771, he was concertmaster of the orchestra known as the Concert des Amateurs (the title is deceiving.) It was thought to be the best orchestra in Paris and perhaps all of Europe. By 1773, at age 28, he was its director. Mozart was then 17 years old. He also frequently played his own violin concertos with this orchestra. Composers of the time, including Antonio Lolli and Carl Stamitz, dedicated works to him. In 1779, at her request, De Saint George, began performing for and with Queen Marie Antoinette at Versailles. In 1787, De Saint George, with a different orchestra, premiered Haydn’s six Paris Symphonies (82-87.) Mozart was in the city at the time, though it is not known whether he attended any of the concerts. (In fact, De Saint George has often been called the Black Mozart.) De Saint George wrote at least 15 violin concertos, 12 string quartets, 9 sonatas for violin, 10 sonatas for harpsichord, 3 symphonies, 8 symphonies concertante, and other works, among them an opera and other works for the theatre. One of the violin concertos has been recorded by Rachel Barton. Other than that, his music is now almost never played. However, YouTube has a six-part biography of him as well as several videos of his music. 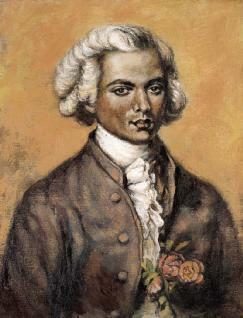 Joseph De Saint George died on June 10, 1799, at age 53. Thanks for this. I will look for his music. Do you know if his quartets are published?